$40,000 to Zonta House Refuge Association in WA to fund the Positive Pathways to Safety from Women, a preventative program assisting women to lead more independent, safe and fulfilling lives. Telethon Kids Institute received $39,450 towards the Remote Aboriginal Women Community Researcher project.The project will train 10 Aboriginal women from remote communities across the Fitzroy Valley to become community researchers, exploring long-term intervention for Fetal Alcohol Spectrum Disorder. Each woman will be supported to complete a Certificate II in Community Health Research and will have access to valuable work experience for future careers in research. $40,000 to Cambodian Children’s Fund to train Cambodian female police officers in the Child Protection Unit.24 female police officers will receive specialist training for interviewing child victims of serious crimes, assisting in the expedient arrest of offenders. Each will learn how to obtain important facts and evidence from interviews, and importantly reduce the number of times children must recount crimes to local authorities. $20,500 to Classroom of Hope will support young women from rural Cambodia to participate in science and maths studies.With local partner Kampuchean Action for Primary Education, this project empowers 10 young vulnerable women to undertake Science, Technology, Engineering, and Math (STEM) studies in 2-year tertiary-vocational degrees. Personal development training and career counseling will also be provided to ensure high employment rates upon graduation. $40,000 to Opportunity International to fund Build Healthy Futures, a program in rural Indian communities to train female health leaders in basic health education and empower them to be change agents in their communities. $14,400 to Global Development Group to fund the Restore Rose program in two Cambodian provinces. The program’s main aim is to address the health and hygiene needs of women in villages of extreme poverty. The funds will provide 4800 women with a menstrual cup which will not only give them access to better health but also better access to education and work. These projects were very carefully chosen through a robust and transparent grants assessment and member voting process. It was a dynamic, inspiring and insightful process for all. If you haven’t been involved in 100 Women yet, here are 15 reasons to get involved in 100 Women. Why join 100 Women – here are 15 reasons! 2. 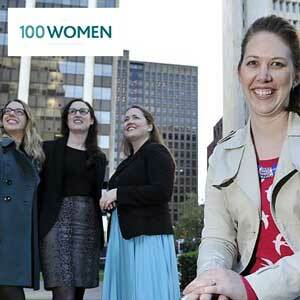 Choose projects to fund collaboratively using the 100 Women grants process. Learn skills to assess grant projects, come together as a team to share your insights. Or if you don’t have time for that, just vote for your favourite project at the end of the process! 3. Are women’s issues important? One of our Ambassadors, Rabia Siddique asked two important questions at the Grants Ceremony in 2014 borrowed from Emma Watson’s #heforshe launch speech: Do women’s issues matter?, If not you, than who? and If not now, than when? 9. Be involved in one of the fast trends in philanthropy – Giving Circles! Giving circles are an exciting new, collaborative form of philanthropy. 10. Get actively involved in 100 Women. There are many ways to be involved in 100 Women as currently we are completely run by volunteers. Join as a full member, join as a mini circle or join our email database. Contribute your skills and expertise to one of our five sub-committees – Membership and Events, Operations and Finance, Marketing and Communications, Events, and Grants. 11. Learn skills to get involved in the community more broadly. Our members have said they have learnt skills and gained confidence to be involved in other community organisations such as becoming a Board member, mentor or volunteer. 13. Feel proud to be involved. Members tell me all the time how proud they feel to be involved in such a wonderful inspiring cause. When was the last time you felt proud? 14. Step up! For the majority of our members, $1200 is a step up in their philanthropy. 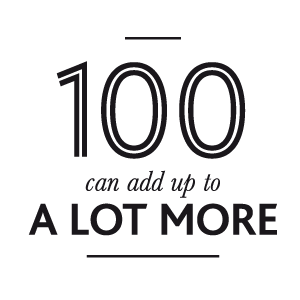 This is so 100 Women can provide large, high-impact grants to projects and organisations. Our intention is to build a strong, sustainable source of funding for women’s projects. Remember it’s a tax deduction and 100% of your donation goes to the grants too! 15. We created this! Together we’ve started our own funding source. The grants mentioned above have been funded by people power. This is incredibly inspiring and exciting. If you’re inspired by this come join the fun and spread the word! Join as a 100 Women member here and share the message with others.